Tanks, jackets and espadrilles, Patralekhaa wore it all (relatively) dressed-up and dressed-down. And she made both looks work for her. 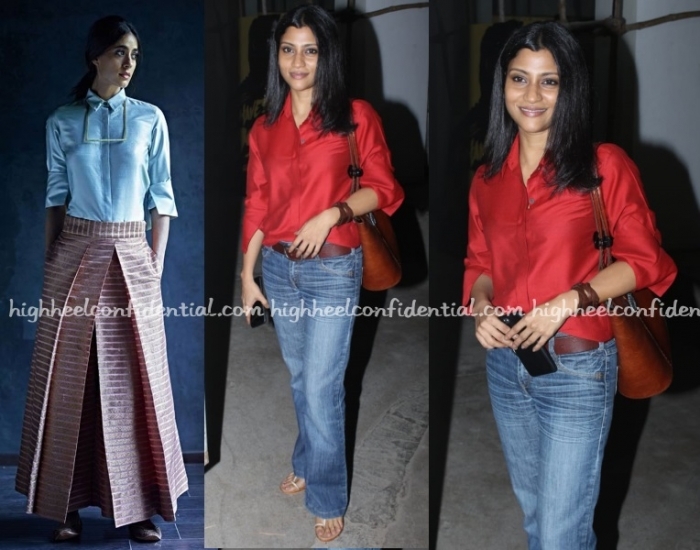 Wearing a silk Payal Khandwala shirt with denims, Konkona attended the screening of Bhavesh Joshi on Thursday evening. Did you like how she wore the silk shirt? I sure did. Wearing a floral print sari from Neeru’s, Sonam attended VDW promotions on Thursday morning. While she sported the pally in tight pleats in the morning, later in the evening at the screening of her brother’s movie, she opted for a more casual drape. Much preferred the pallu down drape.